Updated at 10:28 a.m. Eastern. Iranian security forces beat anti-government protesters with batons Wednesday on the sidelines of state-sanctioned rallies to mark the 30th anniversary of the U.S. Embassy takeover. The counter-demonstrations were the opposition's first major show of force on Tehran's streets in nearly two months. The opposition sought to display unity and resolve after relentless crackdowns on their protests following the disputed June presidential election. Though the crowds were far smaller than during last summer's outrage, authorities were ready with the same sweeping measures: dispatching paramilitary units to key locations and disrupting mobile phones, text messaging and Internet access to frustrate protest organizers. The contrasts in the latest protest wave were stark: people chanting "Death to America" outside the former U.S. Embassy while hundreds of opposition marchers in central Haft-e-Tir Square denounced President Mahmoud Ahmadinejad with cries of "Death to the Dictator." Other opposition protesters marched silently and flashed the V-for-victory sign. Many wore green scarves or wristbands that symbolized the campaign of opposition leader Mir Hossein Mousavi, who claims Ahmadinejad stole the election from him through fraud. Mousavi and his allies, including former President Mohammad Khatami, appeared to encourage opposition protesters to return to the streets. One eyewitness told CBS News via telephone from Tehran that he had watched multiple groups of opposition supporters - less than 100 in each - gather in Haft-e-Tir Square. "The opposition supporters where chanting anti-government slogans. As security forces neared them they dispersed but there were some small clashes. I saw at least two tear gas volleys fired at the demonstrators," said the witness, who asked not to be identified. "The atmosphere is very tense, but there are too many security forces, both in uniform and Basiji," the witness said, referring to Iran's paramilitary force blamed for much of the post-election violence during the summer. "The security presence is very heavy." Witnesses told The Associated Press that security forces - mainly paramilitary units and militiamen from the elite Revolutionary Guard - swept through the hundreds of demonstrators at Haft-e-Tir Square, clubbing, kicking and slapping protesters. The witnesses spoke on condition of anonymity because of fear of reprisals from authorities. Pro-reform Web sites said police fired into the air to try to clear the square - about half a mile from the annual anti-American gathering outside the former U.S. Embassy. The report could not immediately be independently verified. The state-run Islamic Republic News Agency reported police also used tear gas to disperse protesters in other parts of the city. There was no independent information on injuries or arrests, but state-run Press TV said no one was hurt. A leading opposition figure, Mahdi Karroubi, fell to the ground after being overcome by tear gas, according to a posting by his son Hossein on Karroubi's Web site. His supporters carried him into his car, which plainclothes government supporters attacked as it drove away, the account said. Karroubi did not need medical attention, his son said. Other witnesses - also speaking on condition of anonymity - said about 2,000 students at Tehran University faced off against security forces, but there were no immediate reports of violence. Videos and photos quickly appeared on social networking Web sites showing alleged images of the clashes. None of the online content could not be independently confirmed. The opposition movement began as objection to Ahmadinejad's re-election, but it has expanded into a catchall movement for complaints that include the unlimited powers of the ruling clerics, Iran's sinking economy and its international isolation. Their tactics now appear to rely on pinpoint protest strikes to coincide with government-backed events, such as September's anti-Israel day. The size and scope of Wednesday's protests were difficult to determine - possibly several thousand, according to witnesses. But the total is significantly smaller than the hundreds of thousands who streamed into the streets last summer during the worse domestic unrest since the 1979 Islamic Revolution. 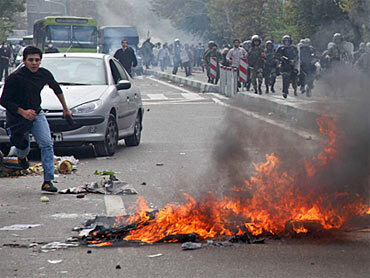 Some opposition groups reported demonstrations in other cities such as Shiraz and Isfahan. Media restrictions now limit journalists to covering state media and government-approved events, such as the rally outside the former embassy. Authorities appeared determined to avoid opposition rallies overshadowing the anniversary of the embassy takeover. They had warned protesters days in advance against attempts to disrupt or overshadow the annual gathering outside the former embassy, which was stormed by militants in 1979 in the turbulent months after the Islamic Revolution. Fifty-two Americans were held hostage for 444 days in a crisis that began a three-decade diplomatic freeze between the two nations. Security forces fanned out around Tehran at daybreak on Wednesday after opposition leaders refused to call off their appeals for counter demonstrations. Volunteer militiamen linked to the Revolutionary Guard patrolled the streets on motorcycles - a familiar sight during the summer unrest. Hours after the clashes, police helicopters passed low over Tehran's rooftops. Outside the former U.S. Embassy, thousands of people waved anti-American banners and signs praising the Islamic Revolution. The main speaker, hard-line lawmaker Gholam Ali Haddad Adel, denounced the United States as the main enemy of Iran. He did not mention the talks with the West, including the United States, on Iran's nuclear program. But he labeled opposition leaders as dangerous for the country, saying they claim to support the ideals of the Islamic Revolution but aid Iran's perceived enemies. In Washington, President Barack Obama noted the anniversary of the takeover of the U.S. Embassy and urged the two countries to move beyond the "path of sustained suspicion, mistrust and confrontation." The hostage crisis "deeply affected the lives of courageous Americans who were unjustly held hostage, and we owe these Americans and their families our gratitude for their extraordinary service and sacrifice," Obama said in a statement.